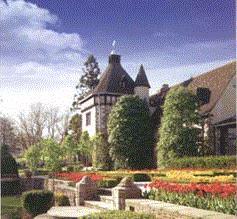 Pleasantdale Chateaux is a vast, Normandy castle style estate, located in West Orange, New Jersey. It was completed in 1933 for Dr. Charles W. Nichols of Allied Chemical & Dye Corporation. The entrance has 15th century Spanish tiles on the floor and there an indoor pool. They now hold conferences and weddings there. Have been to several of the places you show in NJ. Regarding Pleasantdale, my father used to work for Allied and took me to this beautiful place when I was very young. I still remember being awed by an indoor pool and I seem to remember a balcony that made me imagine all sorts of things. It was quite impressive and I had to be on my best behavior.